I’ve been making so many “one pot” recipes lately that I feel like it’s been ages since I’ve made a good ol’ side dish. 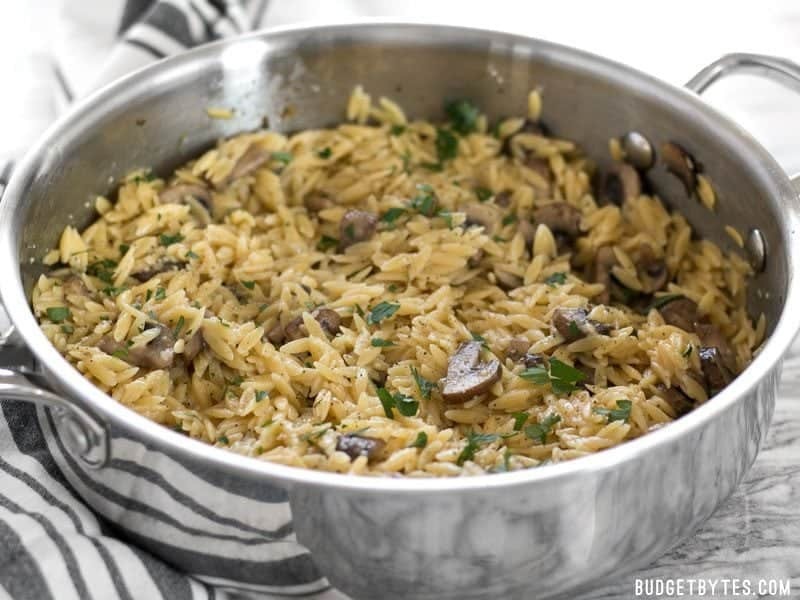 Well, I had a bag of orzo sitting in my pantry and baby portobellos were on sale this week, so I whipped up this incredibly easy Parmesan Portobello Orzo. 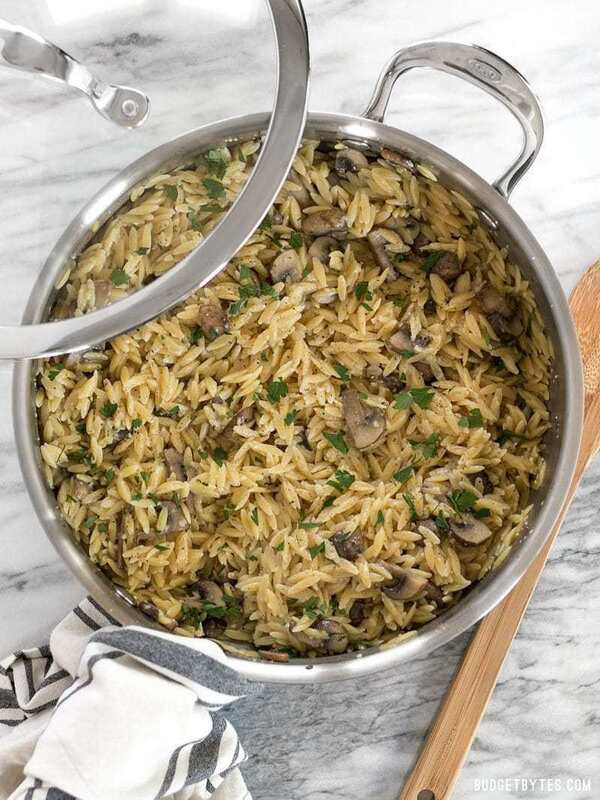 The flavors this Parmesan Portobello Orzo are simple. Mushrooms, garlic, chicken broth, and parmesan. Oh, and a little salt and pepper, of course. The beauty of keeping flavors simple is that this side dish can be paired with a great number of things. I planned to eat this with some chicken, but it could just as easily go with a beef roast or pork chops. Or, as I’ve mostly been eating it, just by itself! This is definitely going to be one of my no-brainer go-to side dishes from now on! I can’t wait to see how many variations I can make of this one simple dish. 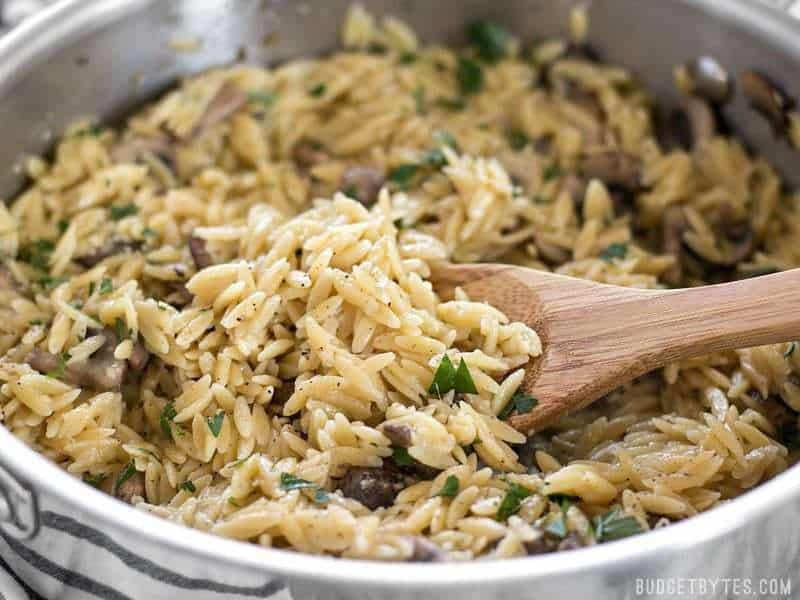 This super simple and flavorful Parmesan Portobello Orzo will become your next go-to side dish. Ready in 30 minutes, it pairs with chicken, beef, or pork. Rinse the mushrooms and cut them into thick slices. Mince the garlic. Heat the garlic and olive oil in a large skillet over medium heat for one to two minutes, or until the garlic is soft and fragrant. 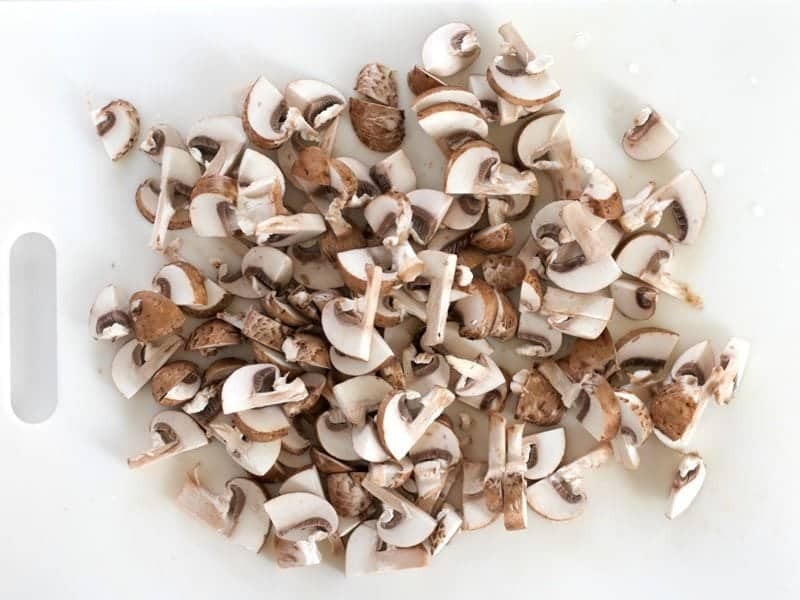 Add the mushrooms, a pinch of salt and freshly cracked pepper, and continue to sauté until the mushrooms have softened and released all of their moisture (5-7 minutes). Add the uncooked orzo and chicken broth to the skillet. Give it a quick stir, place a lid on top, and let the mixture come up to a boil. Once it reaches a boil, give it quick stir again to loosen any pasta from the bottom of the skillet. Replace the lid, turn the heat down to low, and let the pasta simmer on low heat for 10 minutes. Stir once half way through to prevent the pasta from sticking. 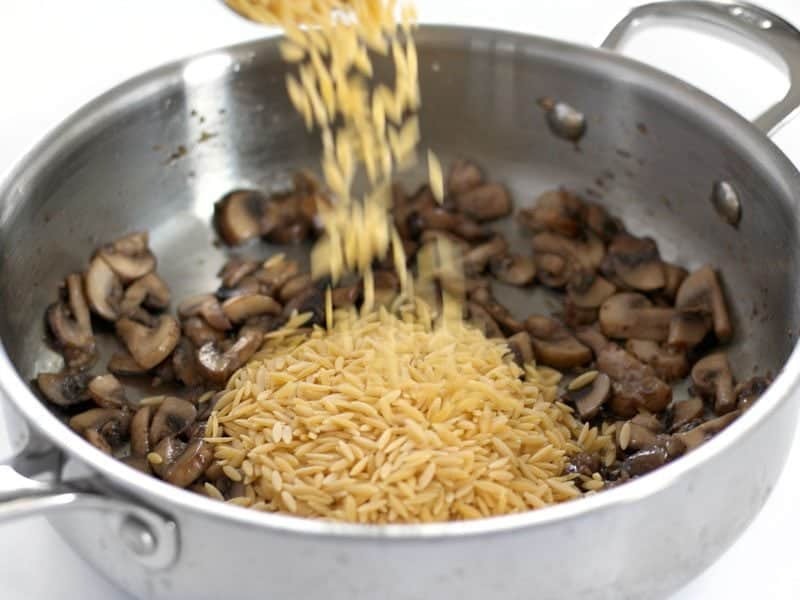 After ten minutes, test the orzo to make sure it's tender (if not, replace the lid and let simmer a few minutes more). Stir the contents of the skillet to redistribute any leftover broth (it will continue to absorb into the pasta). Once the broth has absorbed, turn off the heat. Sprinkle the Parmesan over the pasta, stir, and then serve. *I use Better Than Bouillon brand chicken base to make my broth. I added parsley to add color to the photo, but it’s not necessary for the flavor in this dish. I was lucky enough to get these portobellos on sale, but you can sub regular white button mushrooms if portobellos are out of your price range. You’ll need one 8oz. carton. Rinse the mushrooms and then cut them into thick slices. 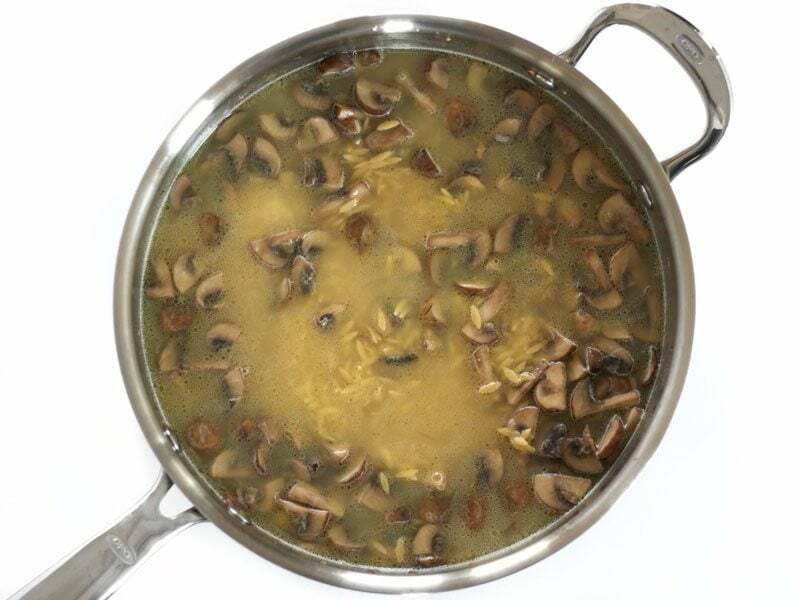 Now, you may have heard the “rule” that you’re never supposed to rinse mushroom, but in a dish like this where they will literally be simmering in liquid, it doesn’t really make a difference. Something like a fresh salad, on the other hand, you’ll want to just wipe them off. 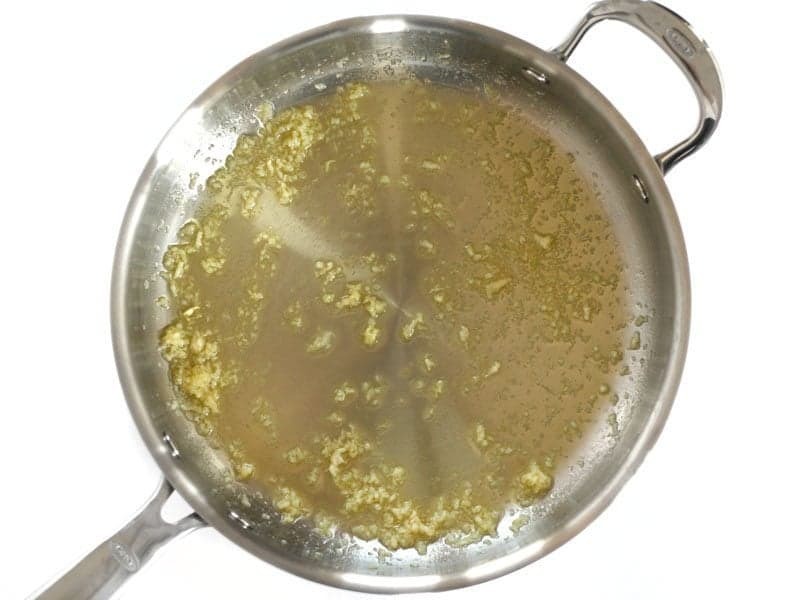 Mince two cloves of garlic and sauté them in a large skillet with 2 Tbsp olive oil over medium heat for one to two minutes, or until the garlic is soft and fragrant. Add the mushrooms, a pinch of salt and pepper, and sauté for another five minutes or so, or until the mushrooms have wilted and released all of their moisture. 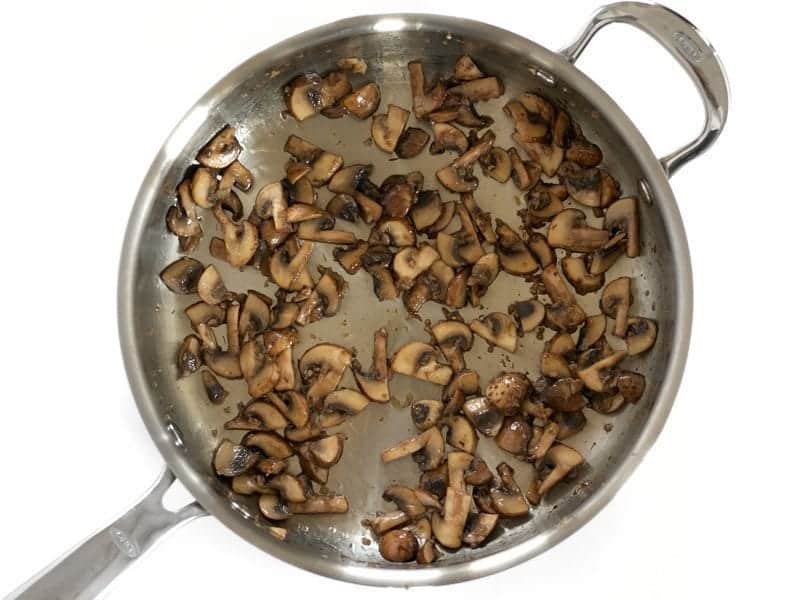 The mushrooms will absorb the oil at first, but once they start heating, they will start giving off moisture, which will collect in the bottom of the skillet. Once that liquid starts evaporating (becoming LESS), you’ll know the mushrooms have given off everything they’re going to give. Ha. And 3 cups of chicken broth. Stir the skillet, then place a lid on top. Let the skillet come up to a boil over medium heat. Give it a quick stir to loosen the pasta from the bottom of the skillet, replace the lid, and turn the heat down to low. Let it simmer on low for about ten minutes, stirring once half way through. After ten minutes, test the orzo to see if it’s tender. There may be a little broth still pooling in a couple areas, but if you stir the pasta, it will continue to absorb the leftover broth. Once the broth is absorbed, turn off the heat. 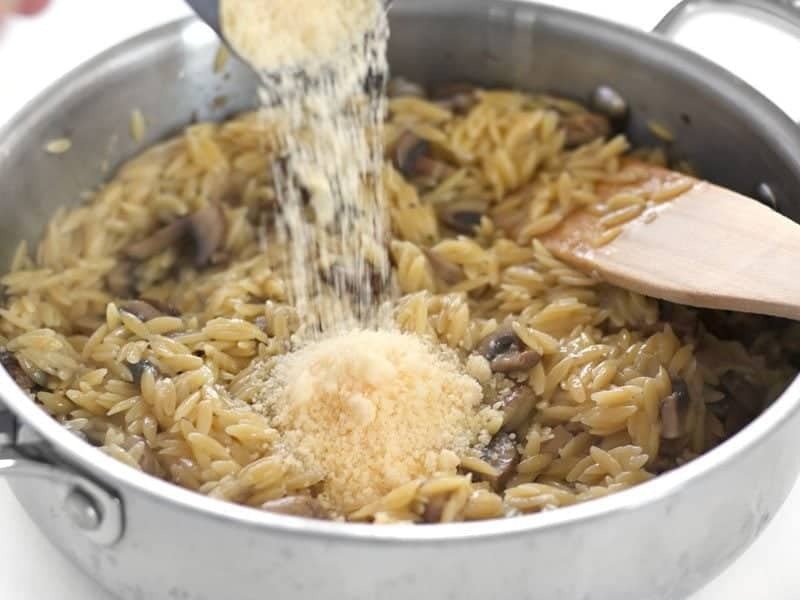 Sprinkle 1/3 cup grated Parmesan over the orzo, give it a stir, then serve! Super easy. Yummmmmm. 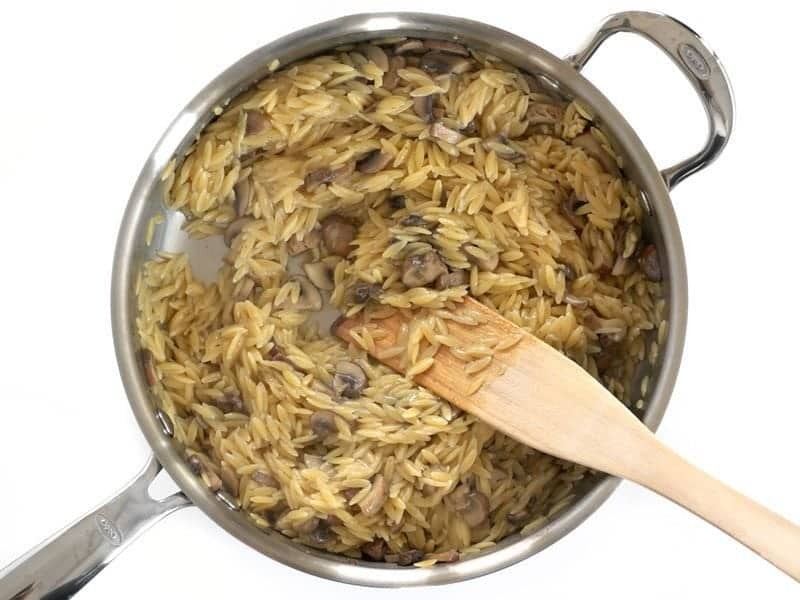 Makes about 6 loosely packed cups of Parmesan Portobello Orzo. Thanks you for the delicious recipe! I added fresh asparagus the last five minutes because I had touse it up. Fantastic and super easy!Beats the package stuff for sure! I made this tonight as a freezer/pantry meal. I used some sautéed button mushrooms that I had frozen (bought some on clearance a couple months ago), along with a half pound of frozen ground beef. I didn’t have Parmesan, so I used the last 2 Tbsp of Garlic and Herb Aloutte spread I had in my fridge… Served as a main dish and so delicious! Made this tonight with a couple modifications – diced half an onion to sauté with the garlic, added some browned ground pork before the orzo (hurrah for leftovers), plus some chopped arugula halfway through simmering. 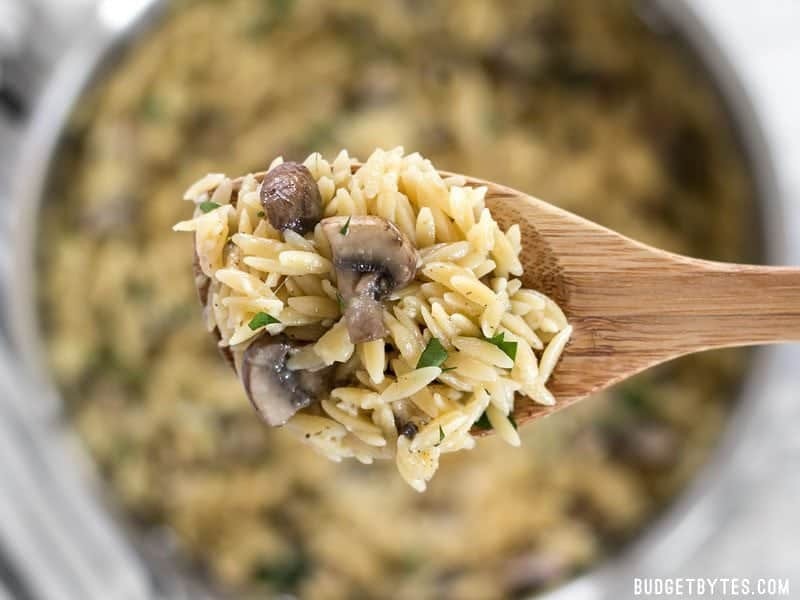 Never had orzo before but this was really great, will definitely be making again. P.S. Thanks for all the simple yet awesome recipes, your site has been a real lifesaver for a student learning to cook for the first time! Has anyone tried to freeze this? Trying to pre-prepare some dinners and this might be a good one. I made this recipe thinking it was a main dish, it wasn’t until I actually started cooking I noticed it was supposed to be a side dish. But I kept cooking and OMG it was soo good! I’m always on the hunt for good meatless dishes and this will be a new go-to! Thanks so much Beth! Does this recipe freeze well? I’m trying to make an emergency good food freezer stash for test weeks. This one will probably be just so-so in the freezer. It will be a bit more dry and less saucy once thawed and reheated. This is great! Just what I was looking for in a flavorful orzo recipe. I left out the parmesan (don’t care for it) and added spinach in the last five minutes. Very tasty. A couple pats of butter enhance the flavors as well. I made this tonight and it came out great! I added a package of Sea Pak Shrimp for Scampi, so pre-seasoned with butter and garlic and whatnot. So I took down the amount of broth by about 1/4 – 1/2 cup because it seemed like the shrimp was giving off a bit of liquid as it defrosted. I totally forgot to add the salt & pepper so I did it at the table, and also forgot to add in the greens as I was cooking (I had bought asparagus), but it was still so insanely delicious as a main dish (what can I say, I was drinking wine while I cooked – it happens! :) ). I will absolutely make this again. I also love the Better Than Bouillon after seeing Beth mention it here. I have a jar of chicken & a jar of veggie in my fridge, it’s so convenient! So good! I added spinach at the end and then drizzled on some balsamic vinegar. Your recipes are so good! This orzo was amazing. My boyfriend kept saying it was like the risotto he got in Italy. Yum! I made this tonight and it was a hit with my family. I followed the recipe EXACTLY…except (you knew that was coming, haha) I used Better than Bouillon veggie broth to make it vegetarian, and at about the 8 minute mark I threw in some chickpeas, some frozen spinach, some carrot, and some zucchini. Also, I added the parmesan directly to our bowls instead of to the pot (my husband at first didn’t want cheese on his, but he added some when he had seconds). Thank you for another amazing recipe! Would this freeze well do you think? I like making large quantities and freezing portions for a quick lunch later. Sounds DELISH can’t wait to make this! Yeah, I think this would probably freeze pretty well. :) I didn’t get to try it, though, cuz I gobbled it all up! Would there be any value in substituting one of the cups of chicken broth for a cup of white wine? Thought it might add some flavour and my wife and I can get good stuff for real cheap! Yes, that would probably be delicious! You might need to taste and add salt if needed at the end, since broth provides most of the salt for this recipe. Mushrooms are not my favorite, what could I use instead of mushrooms? Green peas or asparagus might be nice. I made this tonight for our dinner as a main course and it is delicious! I added a pinch each of dried rosemary and dried thyme while sauteeing the mushrooms, and stirred in a handful of frozen peas during the last few minutes of cooking. Will be making this again for sure! I think it would be awesome with a bit of shredded chicken or crumbled italian sausage thrown in, too.